Step 1 Blanch the spinach in a large pot of boiling water to bring out the vibrant color and wilt just slightly, about 1 minute. Drain and shock the spinach in a bowl of ice water. Drain the spinach again, pressing out all excess water. You should have one-half cup. Step 2 Place the edamame and garbanzo beans in the bowl of a food processor, along with the spinach, garlic, lemon juice, tahini paste, ground ginger and salt. Pulse until the contents are the consistency of a coarse paste. With the processor running, drizzle in the olive oil until the mixture is smooth. Place the hummus in a nonreactive bowl, cover tightly and refrigerate until needed. This recipe makes 4 cups hummus, more than needed for the sandwiches, and can be used as a spread on crackers or bread. It will keep for 4 days refrigerated. In Recipes-list.com we have selected the most viewed recipes from category - Sandwiches . Enjoy the best recipes specially selected for you! 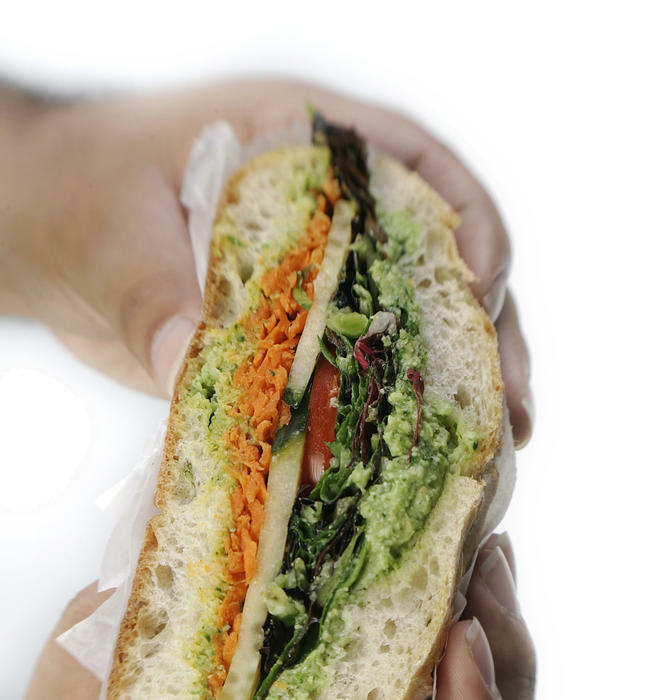 Edamame sandwich is the right choice that will satisfy all your claims.